Description of "Artificial Intelligence in Healthcare"
Do you want to know the relationship between Artificial Intelligence (AI) & healthcare, & how AI is improving healthcare? Technology is evolving rapidly, & you need to keep up to stay at the top. Artificial Intelligence (AI) is revolutionizing all aspects of healthcare & this book is intended to be your companion on this journey. It’s a power-packed AI book that guides you about the current state and future applications of AI in healthcare, including those under development, in a simple to understand language. It discusses the ethical concerns related to the use of AI in healthcare, principles of AI & how it works, the vital role of AI in all major medical specialties, & the role of start-ups and corporate players in AI in healthcare. Dr. Parag Mahajan is an Accomplished Entrepreneurial CEO of multiple Healthcare Start-ups, Radiologist, Clinical Informatician, Teacher, Researcher, and Author. His current interests include the development of Start-ups in the fields of Artificial Intelligence in Healthcare, Blockchain in Healthcare, Electronic Health Records, and Medical eLearning Systems. 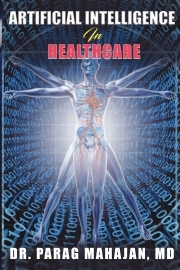 Reviews of "Artificial Intelligence in Healthcare"